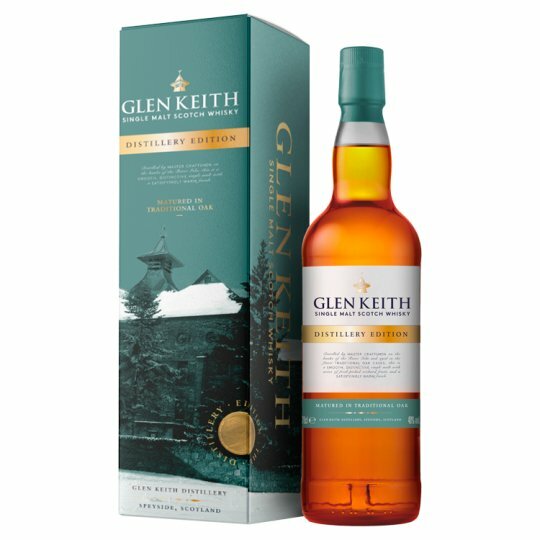 Glen Keith is a single malt scotch aged in the finest traditional oak casks for a distinctive, smooth and easy-drinking whisky. It has hints of fresh-picked orchard fruits, rich toffee notes and a satisfying, warm and long finish. Sold in its signature gift box, making it the perfect whisky to celebrate a special occasion. Serving suggestion: Enjoy served straight, on ice or mixed in a cocktail. The Glen Keith Distillery perches on the Linn of Keith, a sparkling, free-flowing waterfall on the river Isla. It's an historic spot, once the stronghold of the Ogilvie's of Milton, a branch of one of the most prominent ancient clans of Scotland. Today, it is one of Speyside's best kept secrets. Nose: Ripe fruit aromas of pears and apricots, thick vanilla custard and a subtle sweet citrus orange zest. Taste: Sweet flavours of honeycomb and soft vanilla toffee, perfectly balanced with poached pears and delicate notes of marzipan. Finish: Long and smooth with sweet notes of butterscotch. Served straight, on ice or mixed in a cocktail.